I occasionally look to the New York Times for my daily fix of news, but today was the first time since they installed a paywall that I ran up against it (see above). While testing out the paywall Monday afternoon, Mashable readers Dmitry Beniaminov and Yuri Victor pointed out that it’s breathtakingly easy to subvert the paywall. Readers need only remove “?gwh=numbers” from the URL. They can also clear their browser caches, or switch browsers as soon as they see the subscription prompt. All three of these simple fixes will let them continue reading. I used the option to manually delete “?gwh=xxxxx” to continue reading on the Times today. A Safari extension that performs this function would be useful. After a quick Google search, there is another way to bypass the paywall by hitting the “Reader” button in the URL field if you are using Safari 5 [from 9to5mac here]. This will bring up the page behind the paywall notice so that you can read it. If anyone knows of a Safari extension that addresses this issue, please leave a comment on this post. Thanks! Or use Bugmenot. 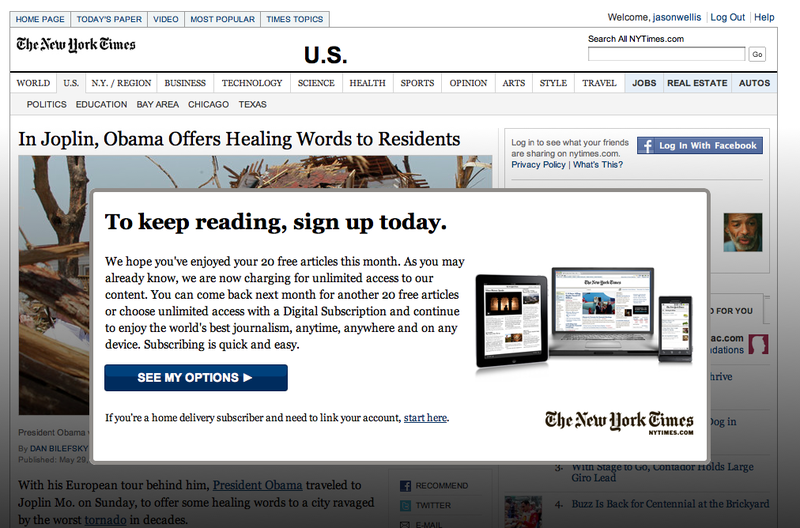 You can bypass a lot of paywalls that way. Thanks for the suggestion–I wasn’t aware of that immensely helpful site!